What does “FOB China” mean? If you’re not in the business of international trade, you’re more liable to associate “FOB China” with ‪#‎accidentalasianhipster‬ than pricing. In the language of international logistics, however, “FOB” stands for “free on board,” a term that doesn’t really resonate without some background. First, you need to understand the costs that a product incurs on its intercontinental journey from a Chinese factory to its final destination in the United States. The most obvious of these is shipping, but there are many others. 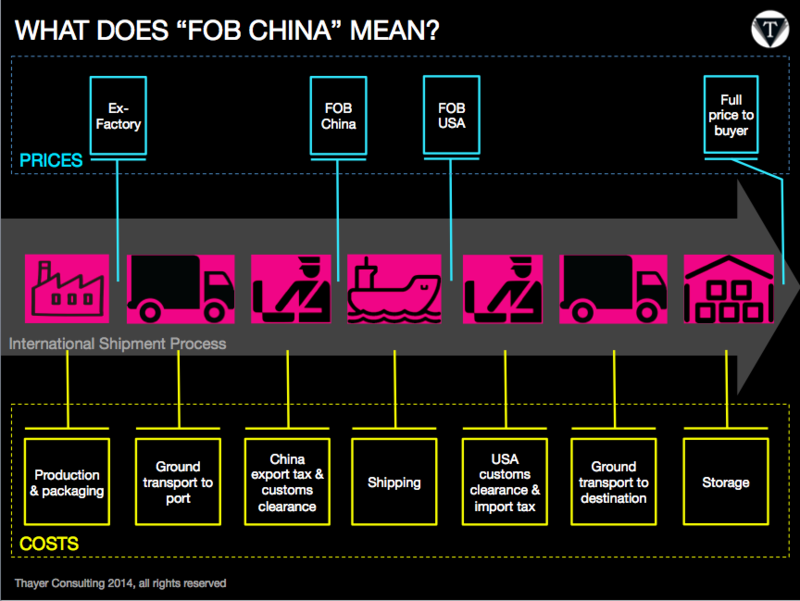 See the attached diagram for a general overview of a boat shipment of goods from China to the US. ￼As a buyer, you eventually need to account for every single cost along the way, but when you are first sourcing production options in China, it is often most effective to compare the price of production plus taking your goods to an international port, getting them through customs, paying any export duties before putting them on a boat bound for the US. That price is the “FOB China” price. With that background, the idea of goods being “free on board” [a shipping vessel] should be easier to conceptualize. The FOB price covers all costs leading up to your goods being on board a vessel at a given stage of the shipment process. Therefore, it can sometimes be useful to use the FOB term to quote a price for getting products to any destination, for example a US port (“FOB USA”) or final destination (“FOB Chicago warehouse”). So, why is FOB China such a widely used term? Why not just ask how much it costs to produce the product (ex-factory price)? One reason FOB pricing is the most common method of comparing Chinese factory prices is that a sourcing decision is never made solely based on a factory’s ability to produce well or cheaply. That decision is made in light of many factors, among which is the factory’s ability to get products to port efficiently. An illustrative example would be a factory in a small, Chinese town with low labor costs, but poor infrastructure. They might be able to produce your product for $1.00 (ex-factory), but need another $0.50 to get it on a boat to the US ($1.50 FOB China). A factory in a metropolitan region with better roads and administrative capabilities may have higher factory costs ($1.25 ex-factory), but still quote you a lower FOB China price of $1.35. For those of you in the industry, would love to hear your comments on when and why FOB pricing is and is not useful for you. For those just getting started, check out our website and feel free to reach out with questions in the comments or via joe@thayer-consulting.com. Posted on October 30, 2015 October 30, 2015 2 Comments on What does “FOB China” mean? Bringing back one of Thayer Consulting‘s very first posts for the inauguration of its blog. 1. Nobody knew you were coming. 5. You see your products in production, with other brand labels on them. 6. They aren’t even remotely embarrassed about it. 7. You sense your risk of cancer sharply rising. 8. You can’t find the exits. 9. You leave with more gifts than samples. 10. You’re at karaoke and it’s still light out.